Last week, at the annual meeting of the American Association of Museums in Houston, I was honored to chair a fabulous panel on empowering museum staff to take creative risks (slides here). This is a topic of particular fascination for me as someone who has worked as an external consultant/provocateur/risk-encourager and is now in the director's seat for the first time. Risk-takers often don't see their choices as risky. Here's a bit more on each of these. Risk-takers need "space-makers" to provide them with the support, the creative license, and the encouragement to try new things, fail, and get up again. Beck beautifully described her entry into museum work. She was told from day one that her director would be disappointed in her if she "didn't fall flat on her face." At first, she was excited, but it took time and trust for her to really believe her supervisors and start to pursue challenging goals. Over time, she transitioned from being a risk-taker to also being a space-maker for others in her organization, holding their hands and cheerleading them through the beginning of a process that would eventually end with a hand-off in which the new risk-takers would take total ownership of their new projects. This concept of space-making resonated with the rest of us, and it also got me thinking about healthy and unhealthy ways to do it. I've talked with many directors who say, "I tell my staff to take risks, but they don't." I suspect those directors are not following up their words with actions that demonstrate their trust and willingness to make space for experimentation and failure. It's not easy to get this right. 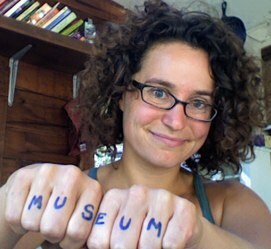 When I worked at The Tech Museum, I employed an less-evolved mode of space-making: the "blame me" approach. Whenever my team got worried that we were taking a risk and might get in trouble, I'd always say, "blame me." Yes, my willingness to take the heat helped us execute a risky project during tough times, but it didn't necessarily empower people to take risks on their own. Beck's approach, in which staff empower each other, is much better for an organization overall. It's one of the things that impresses me most about the Ruru Revolution project at Puke Ariki in New Zealand--it's a fabulous example of staff members making space for each other to take risks together. It's also something I've seen work well in a workshop setting. When an external trainer gives everyone specific instructions to be silly or try something odd, everyone gets to go through the stress, excitement, and positive outcome that comes with healthy risk-taking. Over my time as a consultant, I shifted from planning risky projects with clients to spending much more time just experimenting with them, getting everyone to play and model what it would be like to make a larger risk possible. At one point, Adam Lerner commented that Lori is the ultimate space-maker, supporting creative risk-takers throughout her organization, whereas Adam is more like the art director of a design firm, a risk-taker whose creative vision steers the boat. Both models work; the Oakland Museum of California (where Lori works) is an incredible example of a large, bureaucratic organization undergoing a radical, whole institution redesign, whereas the MCA Denver (Adam's museum) is a small, focused fount of creative expression and ingenuity. I'm still figuring out who I want to be as a leader in my own organization. I've been seen for a long time as a creative risk-taker, but I honestly get the most value out of hearing from people who have run with ideas I've shared and done mind-blowing projects based on them. I think it's easy to undervalue the Loris and overvalue the Adams in this world. I know from where I sit, I feel like I have a lot more to learn about space-making for my staff, volunteers, and participants. When preparing this panel discussion, we spent some time wrangling as a group about the difference between "being creative" and "taking risks." None of us, especially Beck, Adam, and I, who all identify as creative risk-takers, could really parse out what was and wasn't a risk. What drove Adam to keep making these presentations? What drove me to volunteer for new tasks at the Spy Museum despite my boss kicking me under the table to try to dissuade me? What drives anyone who applies for a job they aren't qualified for or asks someone they've just met out on a date? I suspect none of these people would say they are taking a risk. They would say they are doing what they have to do to pursue their dreams. When people tell me they work at an institution where the management doesn't provide the support to take risks, I ask why they stay. I know there are a hundred reasons why people do jobs that aren't entirely fulfilling, but for me personally, that issue is a deal-breaker. I've always been willing to risk my job to do what I thought was right/exciting/necessary, and I never felt like it was a risk. I felt like it was a reasonable tradeoff to do what I needed to do. This leads to the funny problem of answering the questions at the top of this post. Risk-takers might be the worst at understanding what kind of space-making is necessary to help others feel confident and able to take risks themselves. What are you willing to risk to pursue your dreams? What advice would you give someone like me who doesn't wholly understand what is and isn't necessary to make risk-taking possible?